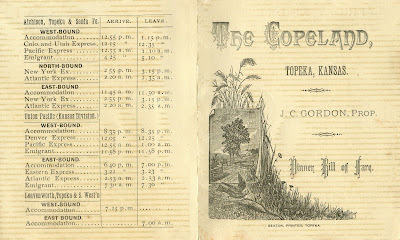 Topeka was then a town of about 20,000, centrally situated on two major railroad lines—the Union Pacific and the Atchison, Topeka, and Santa Fe. (Only a few years earlier, restaurateur Fred Harvey opened his first eatery above the ATSF depot.) According to the timetable below, passengers were given twenty minutes to bolt down a meal before getting back on the train. This railroad schedule also includes the so-called “emigrant trains” that carried newly-arrived immigrants to the West. 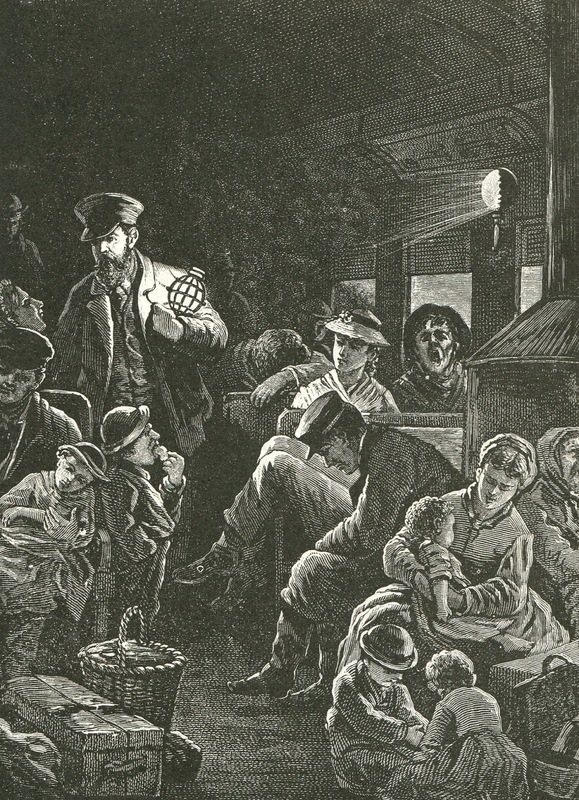 Although the numbers arriving from Germany and the Nordic countries had peaked by the early 1880s, a new wave of immigrants was now arriving from eastern and southern Europe. 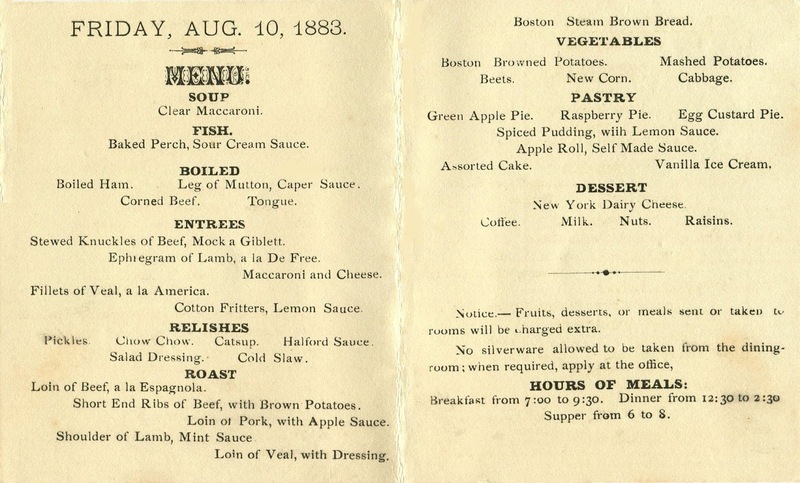 Some of the foods below reflect the influence of the national railroad system which had been growing rapidly since the Civil War. 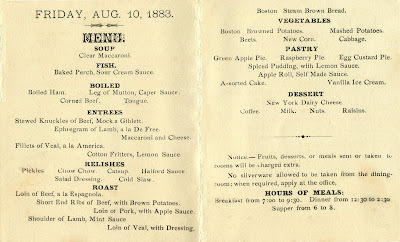 Perishable foods like the “New York dairy cheese” on this daily menu were routinely shipped across the country in freight cars refrigerated with ice. Even the dishes prepared with local ingredients, such as the Boston brown steam bread and Boston browned potatoes, catered to the tastes of an increasingly-transient society. Two of the entrées have patriotic names—fillets of veal, à la America and ephiegram (sic) of lamb, à la De Free. The word “epigram” was used to describe a dish that was made by slowly braising lamb cutlets and storing them overnight. The braised cutlets were then cut on the bias into slices, seasoned with salt and pepper, dipped in beaten eggs and bread crumbs, and fried until golden brown.1 However, the meaning of the descriptor “à la De Free” is open to interpretation. 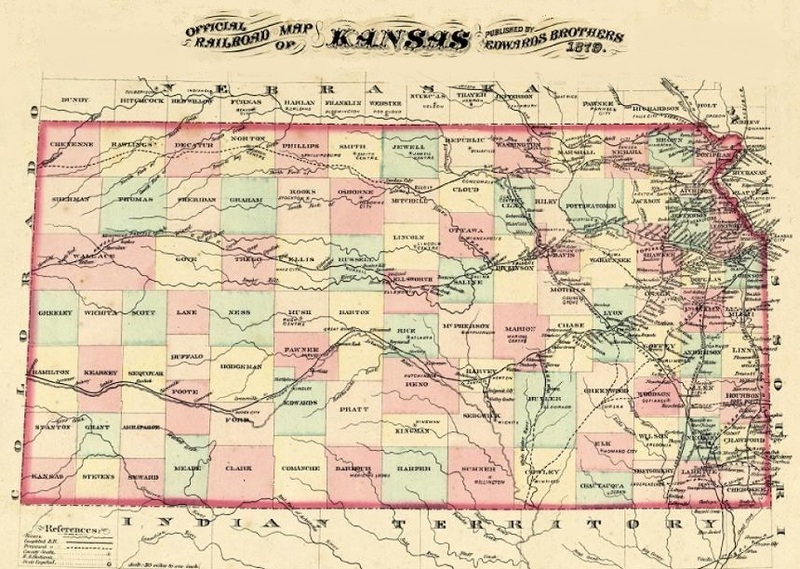 It may refer to the “Kansas Exodus,” the mass migration of 50,000 former slaves that began in 1879, when Reconstruction abruptly ended in the South. 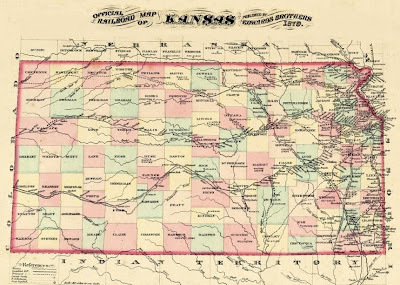 Seeking to escape poverty and racial violence, these impoverished migrants known as “Exodusters” moved to Midwestern states like Kansas, where they received land grants and found better working conditions. The Kansas Freedman’s Relief Association provided the new arrivals with a little money, temporary shelter, and assistance in resettling. Here was an example of American society trying to establish equality and opportunity for some of its native-born citizens, for it was not only the immigrants from Europe who were yearning to breathe free. 1. An epigram is a simple and witty statement that tends to contradict itself. Similar concept dishes appeared in the seventeenth century, such as veal hocks à l’epigramme in La Varenne’s cookbook Le Cuisinier François. New York Times, 9 April 2009. 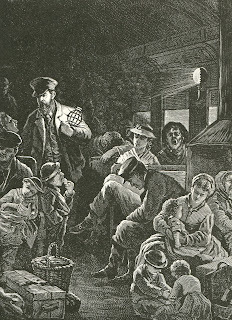 I never much thought about steerage in westbound US trains. I usually think of the poor travelers in wagons, not trains. The menus don't look so bad, I wonder what the quality was like? I must say, the idea of the lamb cutlet bits in crispy crust sounds delish, like lamb fingers! Henry, love this post. I think most emigrant travelers usually brought their own food. Or bought it from peddlers who would come to windows when the trains were stopped. What on earth are cotton fritters?